The size and distinct esophageal bulb allow identification of this organism as a rhabditiform Strongyloides sp. larva. 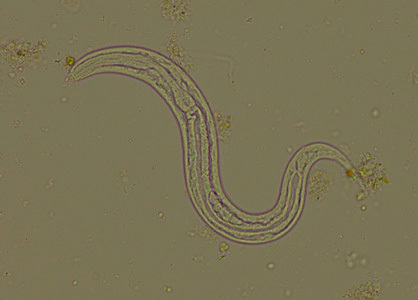 The Baermann technique is a sensitive method to recover this parasite stage in feces, but larvae are also often found on direct smear. ​Strongyloides stercoralis can infect both dogs and humans. Infection is often associated with poor sanitation and crowding. Parasitic worms are female and reside embedded in the mucosa of the small intestine. Mature females reproduce by parthenogenesis and release eggs which often hatch within the intestine and rhabditiform larvae are passed in the feces of the definitive host. In the environment, the rhabditiform larvae undergo successive molts to become either filariform larvae or free-living adult males and females. Filariform larvae are infective to definitive hosts by ingestion or skin penetration, which may give rise to dermatitis. Larvae then enter the circulation and lymphatics and migrate to the small intestine via several pathways to become adult females.